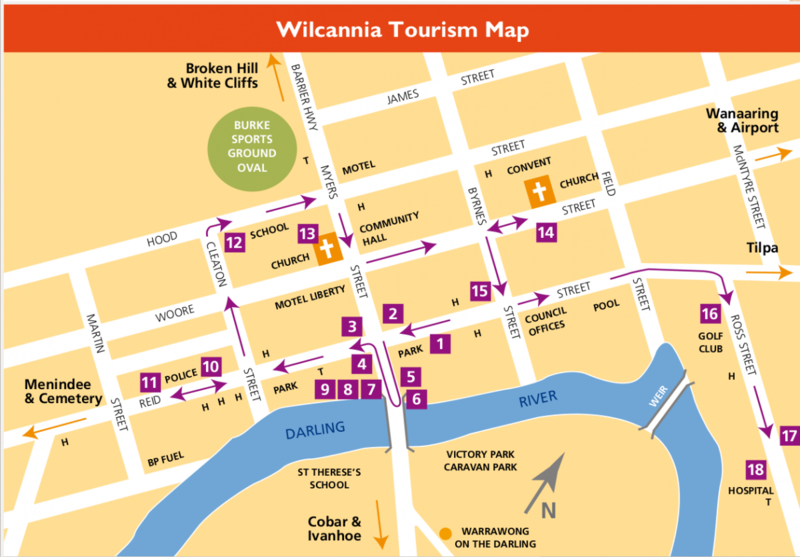 Wilcannia Tourism Association | "Middle of nowhere, centre of everywhere"
It’s getting harder to present an optimistic road ahead. But then if you visualise the handful of willing workers in each of our outback towns and villages who put in tireless hours to make entertainment of all sorts happen for us, then isn’t it fantastic to think we still have those sort of people. They make us proud. It’s those handful who are making the following events possible for you and I. Next weekend is of course Easter. Now you can take your pick of “The Wentworth Mounted Games 20/21st. The big Wentworth Easter Garage Sale on Sunday. Or you can toodle on to Broken Hill for the Easter Sunday Market Day at Memorial Oval. OR, you can keep careering up the Silver City highway to the Packsaddle Gymkhana and Bikehana, it’s on both days 20/21st. What a weekend. And if you pass through our little town, the Wilcannia Tourism Association is running the Driver Reviver Caravan for a break and cuppa for you on Good Friday, Easter Saturday and Easter Monday. We’ll be there from 10 in the morning till 4 each afternoon. Also, close to our site is the caravan dumping site as we are an RV Friendly town. And don’t forget we have 2 really great caravan parks for you, and I hear a whisper we soon will have a “Pop up” buy or swap book shop! More on that soon. 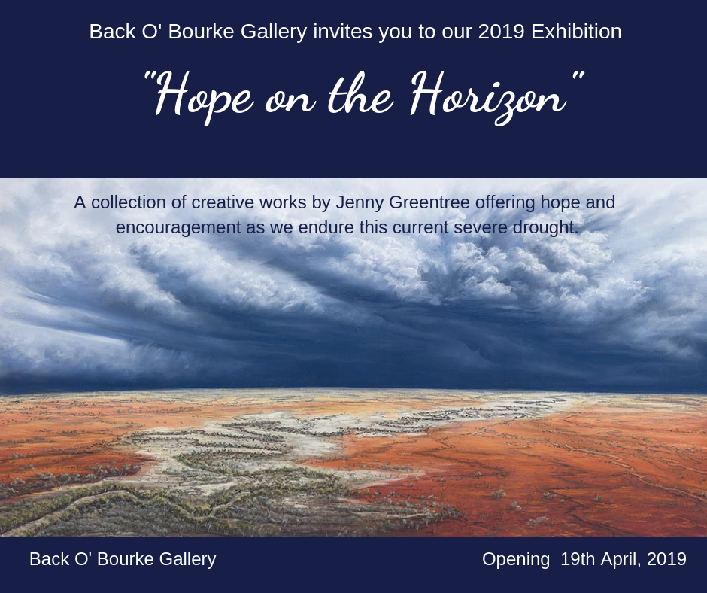 In between the weekend festivities, if you’re near Bourke, Jenny is opening the “Back O Bourke Gallery on the 19th. See the flyer attached and go on in and support her. Next cab off the rank of course is Anzac Day, Thursday week. We here in Wilcannia will have an ex resident to pipe the march to the cenotaph for the 11 o’clock service. And please feel welcome to join in the service at any of our outback towns, we will always welcome you all. Would you believe, the next week end is quite active too. We have a big Gun Shoot at Pooncarie over 2 days, 26/27th. Even if you’ve never shot a gun you’ll meet a heap of wonderful people. And the same weekend is the White Cliffs Rodeo and Gymkhana, they’re having an event almost every week at White Cliffs so they know how to look after you. Bourke to Louth: call 02 6830 8000 AH 0419 722 055 (Bourke Council). 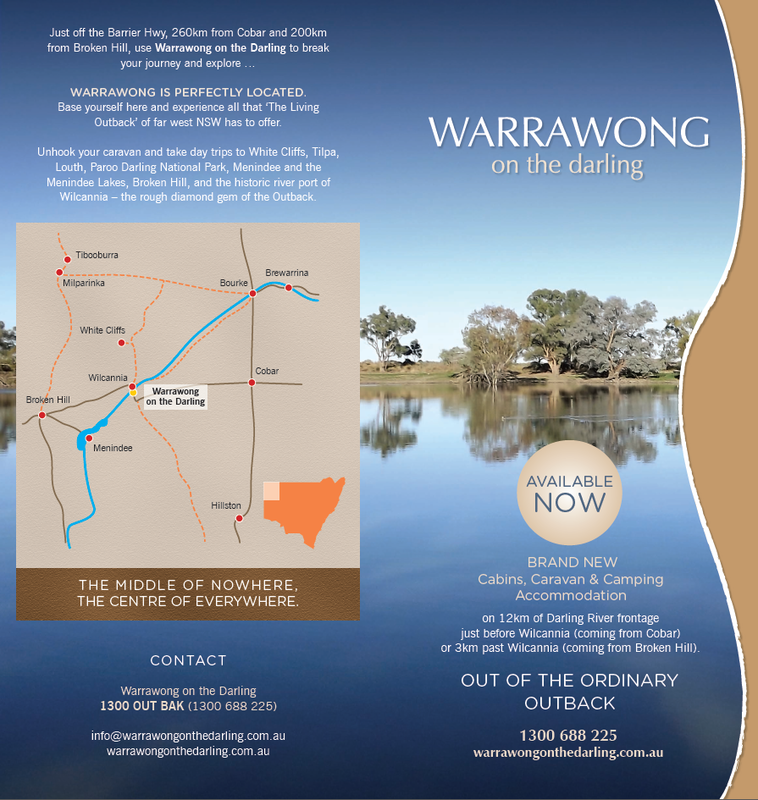 From Wilcannia to Tilpa there is a choice of east or west side. On the east side there is a good National Parks camping ground called Horse and Coaches, about 45k's north of Wilcannia. AT Tilpa the only road is on the west side. No matter how you feel, get up, dress up, show up, Yield. Life isn't tied with a bow, it is still gift. It’s time you joined us – out the back. 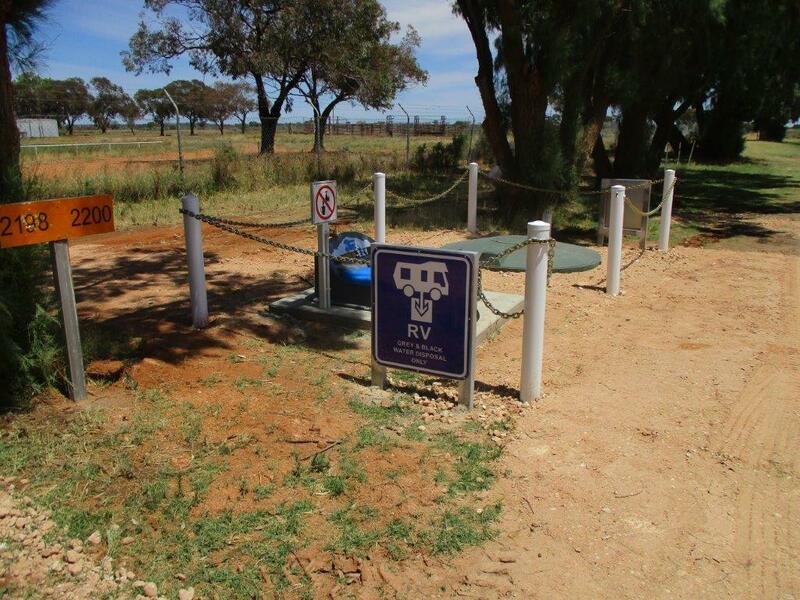 Situated on the Barrier highway, adjacent to the football oval, on the Broken Hill side of the town, easy access. Also on Cobar side as well. For latest information on services, roads, tours and events, please call Tourism Association president, Bill Elliott, on mob. 0429 915467, or make an inquiry via the contact form. Warrawong on the Darling is located on the banks of the Darling River and offers modern cabins, powered caravan sites (some with water frontage) and bush camping. The modern amenities block, beautiful scenery and lush grassy sites along the natural lagoon and river provides travellers the comfort they long for. The usual Family Fun afternoon at the swimming Pool held on Australia Day, Saturday the 26th. Jan. 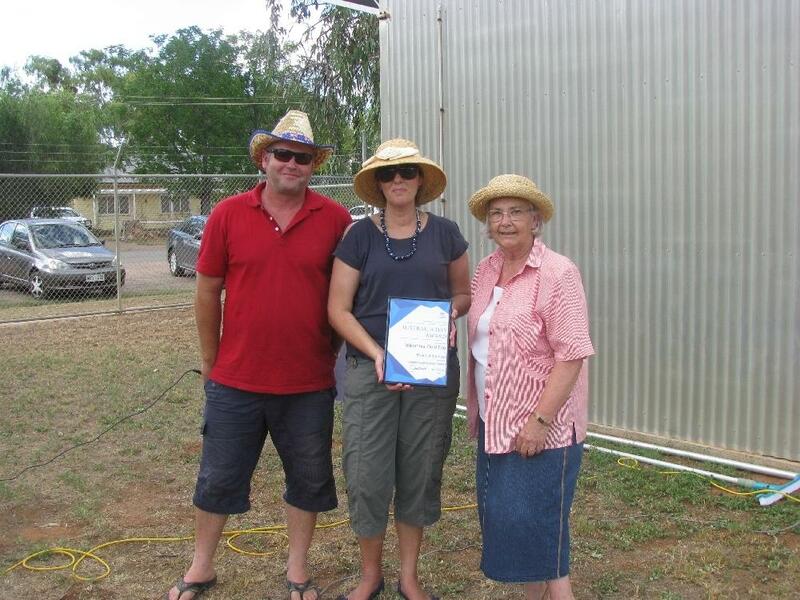 Sponsored by the Wilcannia Tourism Association and the Central Darling Shire. 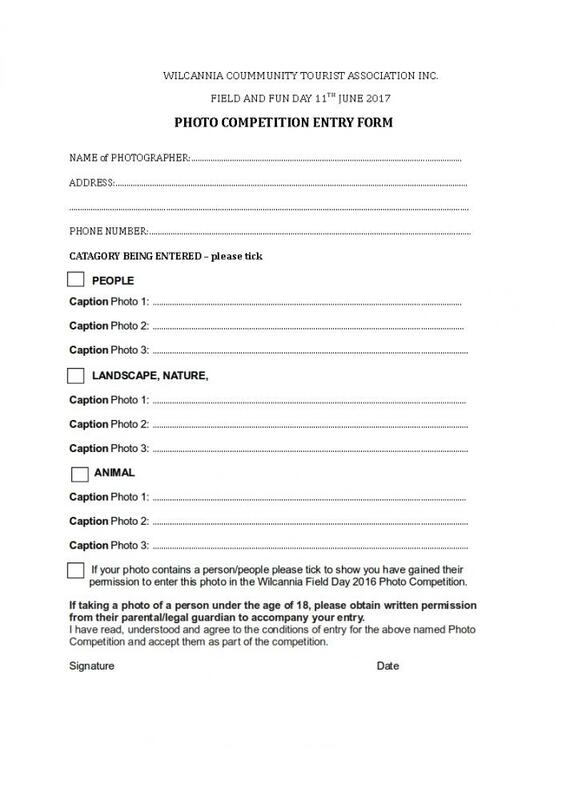 This incorporates the feature event “Annual Throwing of the Gum Boot Competition”, all ages. A substantial Gate Prize is up for grabs. Cold drinks, icy poles etc. available. This will be followed by the presentation of the Australia Day Awards for the town presented by the Shire at 6pm. 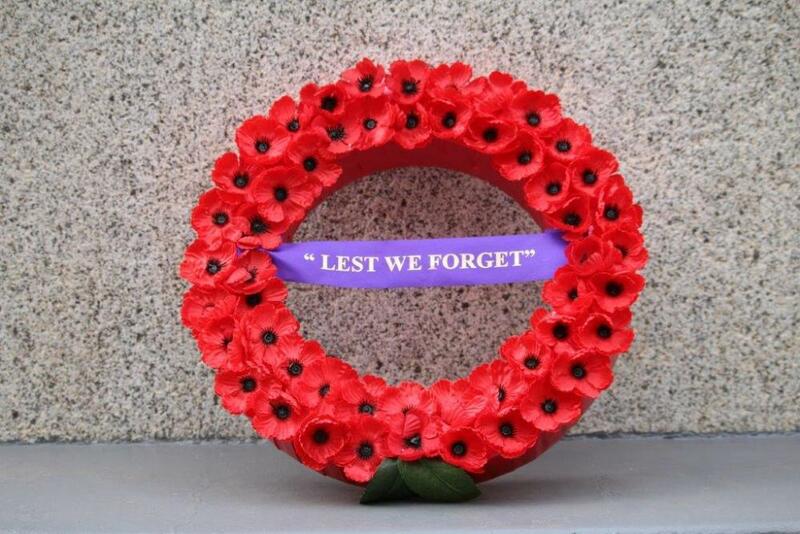 The service will start at 10.45am at the Cenotaph in Baker Park, Reid St.